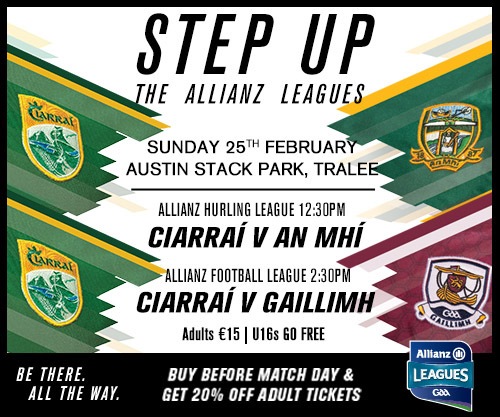 Kerry secured their third win in the Allianz Hurling League Division 2A after a more than comprehensive sixteen point win over Meath on Sunday afternoon in Austin Stack Park, Tralee. Kerry now sit second in their table behind Westmeath in first and ahead by points difference over Carlow who sit in third. Contrary to the end result, both sides started strong with Shane Conway putting over a free with just over a minute played to score the games first point. Meath however went down the other end and minutes later they managed to score a goal, Alan Douglas the scorer giving Meath a two point advantage less than fifty seconds after Kerry had taken the lead. The sides exchanged scores shortly after the Meath goal, with Kerry managing to level matters in the sixth minute with Brandon Barret, Shane Conway and Padraig Boyle all scoring. Kerry who were playing against a strong wind, seemed to have all the momentum and enjoyed a fruitful goal scoring spell by the ninth minute. Both goals coming from Corner Forward Jack Goulding, with the Ballyduff man scoring the second after a goal mouth scramble gave him an easy option to score. Kerry were in the driver’s seat and led by nine points with twenty two minutes played, further scores by Shane Conway and Daithi Griffin had them looking comfortable by the midway point. Meath managed two consolation scores with James Kelly and Jack Regan scoring the reduce the margin to seven. However there was a long stoppage towards the end of the half as Daithi Griffin was taken off injured, the St Brendans man unable to continue and had to be carried off the field. Depsite losing Griffin, the Kingdom sealed a great first half performance with two late scores, Brendan O’Leary scoring a great effort increasing Kerry’s lead back to nine going into Half Time. Kerry started the second half like the first back on the scoring foot, Shane Conway delivered a long free from inside his own 65, and the ball ended up inside the Meath net via an own goal as one of the Meath defenders dropped the ball beyond Shane McGann in the net. Back to back frees from Jack Regan reduced the deficit to eleven points before Kerry hit another good spell by the fifty first minute, Points by Jack Goulding, Shane Conway and a monster free by Martin Stackpoole inside his 65 had Kerry ahead by fiftheen as we neared the hour mark. Meath tried to get consolation scores before the hour mark and trailed by thirteen points. Kerry however finished the game on a flourish, scoring five points without reply late on with Goulding, Conway Barret and Boyle all helping the Kingdom to a unanimous victory. Final score in Austin Stack Park, Kerry 3-19 Meath 1-9. Subs: J. Walsh for D. Kelly, A. Forde for J. Kenna, E. Marsh for N. Heffernan, S. Quigley for A, Gannon. Kerry have suffered their second defeat of the Allianz Football League after losing by three points too a much fitter and stronger Galway side in Austin Stack Park Tralee. The game itself was a tight one between the sides in the early stages as it look over four minutes for the first score of the afternoon, Barry McHugh putting over a 45. Kerry managed their first score just two minutes later as Sean O’Shea pointed from a free. Galway had the better of the game in the opening thirteen minutes as they raced to a four point lead, two points for Patrick McSweeney and one each for Barry McHugh and Eamonn Brannigan gave the Tribesmen a healthy advantage. Paul Murphy and Sean O’Shea reduced Galway’s lead to three points either side of Eamonn Brannigan pointing for the visitors. Two scores for Barry McHugh had Galway ahead by five before David Clifford pointed a free on the 13m line in the twenty third minute bringing it back to four. Galway dominated in the first half and a David Clifford point was quickly cancelled out by a well taken Shane Walsh free by the right hand touchline as we headed for the break. 0-9 to 0-5 the half time score in favour of the Tribesmen. Barry McHugh was Galway’s ace in their deck and managed to put more distance between the sides adding a free just after the restart. Kerry were searching for a comeback and two quickfire points by Sean O’Shea and David Clifford reduced the deficit by three in the thirty seventh minute. Just as Kerry looked to come back they were dealt a blow as Eamonn Brannigan broke through the Kerry defence and hit a shot high into the top corner of the net passed Brian Kelly. With Galway now ahead by six points, it was Kerry who took control of the game as we headed toward the fifty first minute, Peter Crowley, Tom O’Sullivan, Stephen O’Brien and David Clifford all pointing to reduce Galway’s lead to just two points. Barry McHugh had a fantastic afternoon for his side as he converted three frees without reply to put five between the sides after sixty three minutes. Eamonn Brannigan added another score just five minutes later to put six between the sides, putting his tally to 1-3 for the afternoon. Kerry surged and fought to come back late on as we headed for seven minutes of additional time, the kingdom managing three quickfire scores in added time to see the game end on a cliff-hanger as there was now just a goal between the sides, two scores from David Clifford and a Daithi Casey point had Kerry in the driver’s seat in the last two minutes. A nail biting finish in the dying seconds almost gifted Kerry a chance to salvage a late draw, but two great saves by Ruairí Lavelle denied the Kingdom a share of the points late on. Final Score in Austin Stack Park, Galway 1-14 Kerry 0-14. Subs: D. Wynne for S.A. Ó Ceallaigh, G. O’Donnell for C. Sweeney (Black Card), S. Armstrong for P. Sweeney, T. Flynn for B. McHugh.